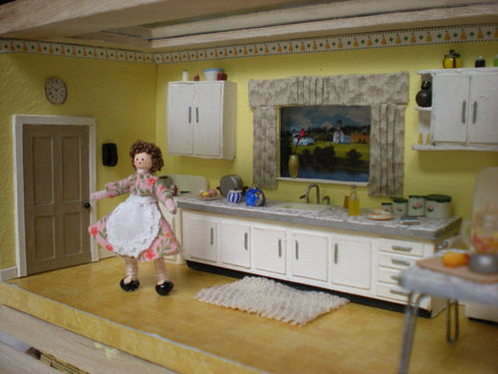 This is my 1950's lady doll in a beautifully detailed 1/48th kitchen setting by Judy Kingsley of Canada. 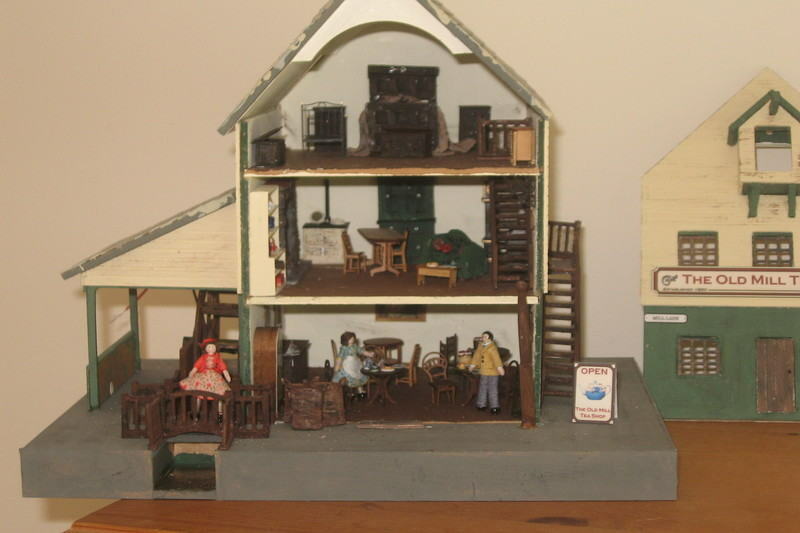 Mavis of the Littlehampton Dollshouse Club has made the up the kit for the "Old Mill Teashop" which is a perfect setting for some more of my 1950's dolls. Some of the furniture has been made by Mavis herself and there are tiny tables set with crockery and food. Jen Floyd asked me to make an Ice Cream Man. 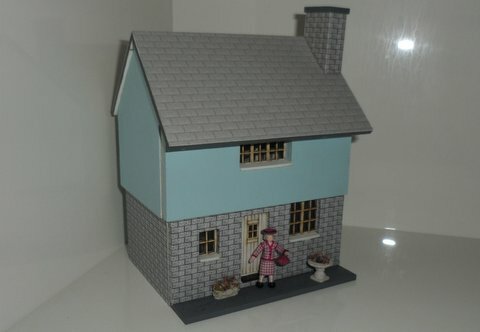 The little Girl Guide is buying an ice cream outside a dear little cottage Jen has made from a kit in 1/48th scale. 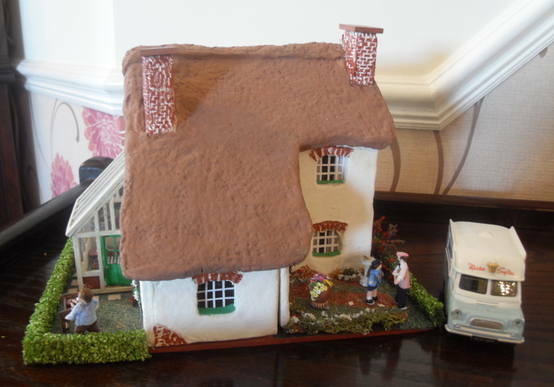 Don and Linda Wright from Kent ordered a Granny to occupy this very smart Town House which Don made from a kit by Petite Properties. 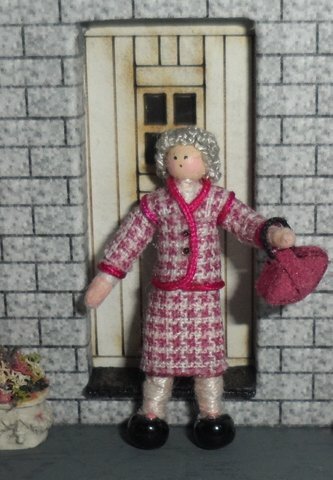 The house is to be a Christmas present for a lady who has recently been in hospital. Arlene Marrs of Aberdeen has sent me this lovely photo of her 'Tudor Gallery'. It contains a set of my 1/48th Henry Vlll and his Wives standing in front of some wonderful Tudor potraits painted on goose eggs! The goose eggs have been painted with ink and include portraits of Henry Vlll, his wives and children. 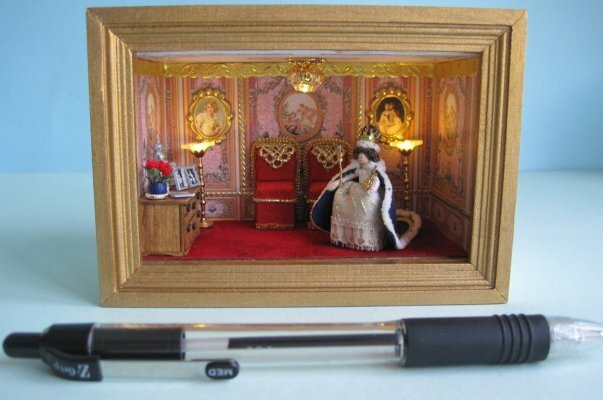 The artist is Di Whitehouse from Shrewsbury who Arlene met at a craft fair at Syon House in Middlesex. 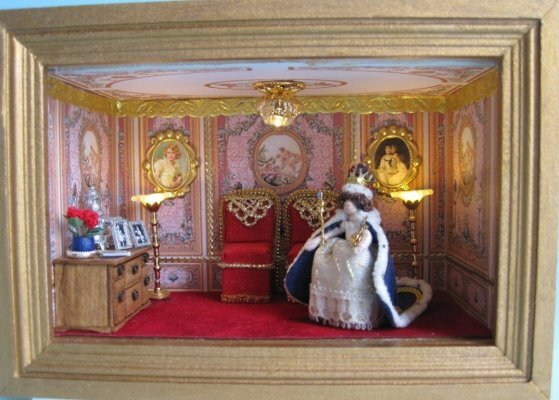 Heather had been given one of my 1/48th scale Elizabeth ll dolls and had been inspired to make her a throne room. Heather brought the resulting tiny roombox to the 2102 Autumn Miniatura show. She very kindly allowed me to display it on my stall while she looked around the show. Although I had already seen photos of the box I was even more amazed by the real thing!